Solutions For Green We also publish California Green Solutions and a series of blogs about healthy living solutions. We don't share your information with anyone else. We ask that parents subscribe to the newsletter. We respect our community's children. We believe we are part of "our village" and need to care for one another. Growing tasty morel mushrooms in small scale agriculture is possible with elm trees and patented morel technologies. Morel enthusiast and biologist-inventor researched practical mushroom production with American Elm Trees that grow morels. Stewart C. Miller, a former biology teacher turned inventor, has done his homework when it comes to morel mushrooms, a culinary delicacy. And his work is bearing fruit - not only for himself, but for people like him who want to grow their own morels. Miller began his morel mushroom cultivation research in 1972 while teaching Biology at Marion High School in Marion, Indiana. He has been studying the relationship between morels - also known as sponge mushrooms - and elm, apple and ash trees since 1992. After years of experimentation, he was awarded US Patent Number 6,907,691 B2 in June 2005 for his morel cultivation process. So how does the morel mushroom ordinarily form in nature? Miller coined the term "symbiotic disruption" to explain the morel mushroom's eccentric growing habits. A suffering or dying tree stimulates the morel fungus inside the root system, causing it to withdraw. Hardened nodules called "sclerotia" form below the ground, then with sufficient water and warmth in the spring, these sclerotia swell and form a morel mushroom. 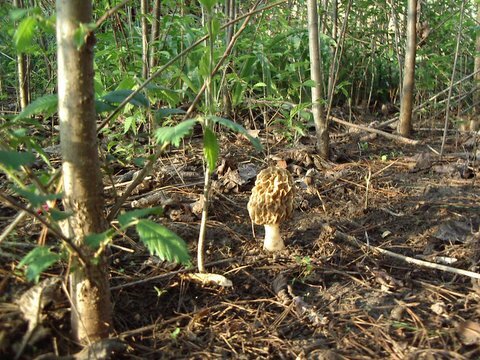 An avid morel mushroom hunter since childhood, Miller explains that growing morels eliminates the guesswork in judging whether wild morels are safe. At his Morel Farms, which consist of three different parcels of land, including a 45-acre tract near Lafayette, Indiana, Miller is growing a combined total of 2,000 apple, 3,000 ash and 5,000 elm trees. The morel mushroom harvest begins in April or May, depending on climate and region. In a test-plot last fall he planted 1,200 elm trees - inoculated with his patented morel fungus - in an open, well-drained and fertile acre of land. "In seven years, according to our projections," said Miller, "each tree will produce approximately five morels for a total of 6,000 morels. Total income for the project would be approximately $7,500. "If you divide $7,500 by seven years," said Miller, "the resulting income would be projected at $1,071 per acre. This and other forms of research will verify our predictions of morel mushroom production and morel farming as a viable crop after considering all expenses." The average backyard gardener, however, doesn't need 45 acres or 1,200 trees to begin growing morel mushrooms. To successfully cultivate a morel crop mushroom gardeners must continuously nurture and care for morel innoculated elm trees as soon as you receive them in November or December. Planning ahead for planting is very important and you must determine where, when, and how to prepare for the planting of your trees before you receive them. Anyone interested in raising morels can purchase disease-resistant American elm trees super-inoculated with the morel fungus. The trees arrive with instructions on planting, care and how to stimulate morel production. Small-scale mushroom production represents an opportunity for farmers interested in an additional enterprise and is a specialty option for farmers without much land. This publication is designed for market gardeners who want to incorporate mushrooms into their systems and for those farmers who want to use mushroom cultivation as a way to extract value from woodlot thinnings and other "waste" materials. Mushroom production can play an important role in managing farm organic wastes when agricultural and food processing by-products are used as growing media for edible fungi. The spent substrate can then be composted and applied directly back to the soil. National Sustaianble Agricuture Information Service provides resources for entrepreneurs who wish to do further research about growing mushrooms as an agricultural crop. Sustainable agriculture starts with species selection to fit your ecosystem. If elm trees and morel mushrooms are native to your region, you can grow this food crop most sustainably. Before you undertake growing morels, you need to check to make sure that morel mushrooms can be imported into your state.